Chris Hobbs and Betty Spicer are the toast of the ladies’ section at Arun Indoor Bowls Club after winning through to the quarter-finals of the national championship at Melton Mowbray. They lost to the eventual winners and they weren’t finished there as they also made it to the national triples with a team of Chris Hobbs, Bridget Collins and Betty Spicer. Meanwhile, Arun ladies played away to Horsham in the last of the ladies’ league matches, losing 93-86. Scores: D Mitchell, M Bonney, S Stocker, W Adams won 20-12; J Foster, R Wiedenheoft, S Miles, M Richards won 21-17; V Greenaway, E Lawrence, M Phillips, B Spicer won 51-18; C Hobbs, L Hathaway, B Collins, A Janman lost 21-10; I Brooker, E Fitch, C Horsley, D Latter lost 28-17. Arun’s ladies and gents went head to head in the last leg of the Osborne Trophy, the ladies winning 141-109. Scores: C Hobbs, T Finch, L Hathaway, B Spicer won 31-18; B Arnell, E Lawrence, M Phillips, M Richards won 18-17; E Keywood, M Bonney, B Collins, A Janman lost 32-10; C Hillier, M Tyrell, J Whitfield, C Horsley lost 28-12; D Mitchell, B Cairns, S Stocker, S Miles lost 25-20; B Lawson, S Simmonds, P Terry, W Adams lost 21-18. West Sussex held their annual Charity Fours tournament and 26 teams from around the county and Kent, Surrey and London competed in a very enjoyable day’s bowling. This year’s beneficiary was the local branch of SERV (Service by Emergency Rider Volunteers), otherwise known as the Sussex Bloodrunners, volunteers who at their own expense, transport blood and other items between hospitals out of normal hours. In the tournament the teams played five games against random opponents and there were three unbeaten teams – Lavant, Midhurst and a combined Infinity/Comptons team. Unfortunately the Lavant team had drawn one game while the others had won all five so these two teams played off for the final placings. The Infinity/Comptons combination of Chris Jeffery, Chris Page, Dan Butler and Charlotte Rollings took an early lead against the Midhurst team of Shirley Weeks, Richard Softly, Chris Morgan and Ron Weeks. The Midhurst combination pulled back but were unable to close the gap and the Infinity/Comptons team ran out winners by 9-6. The day was a great success with more than £700 being raised for the charity. Donnington visited Arundel and enjoyed an overall win. Scores: Marion Corbett, Ann Hubert, Colin Hulbert and skip Peter Whale beat Richard Ballard, Sue Wiseman, Terry Broomes and skip John Kinnard 20-12; Colin Dean, Terry Wiseman, Janine Banham and skip Allan Banham lost 20-19 to Mary Denyer, Ann Olliver, Eddie Buckley and skip Alan Emmery. The game was very good humoured and Donnington were pleased with their win. Hunston played Crablands in their last match of the season and won 59-41. 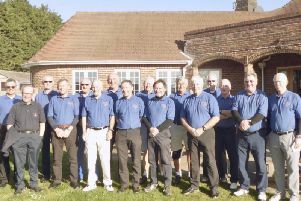 The Hunston club have had an enjoyable season and have managed to win more matches – members are looking forward to September when it all starts again. Scores: D Greenfield, J Stubbs, B Hodnett, C Butler 25-11; J Smith, R Ellams, T Hack, R Stevens lost 21-18; J Hodnett, R King, A Harle, E Whiting won 25-9. Crablands’ eagerly-awaited opening day came and went without a single bowl being bowled on the green. The weather won. They are lucky enough to have an indoor short-mat facility to which they retreated. Winners of a giant Toblerone were Rod Shambrook, Nigel Reynolds, Peter Blackman and Lew Lewendon. A great afternoon was had by all and it was lovely to welcome lots of social members, many of whom assisted catering manager Melva Bateman to provide a great spread. The club hope for better weather this Saturday, April 14, when they welcome all prospective new bowlers between 10am and 1pm at Crablands.